In line with Italy´s weak economic performance over past years, corporate insolvencies registered annual increases between 2008 and 2014, mainly with double-digit growth rates. 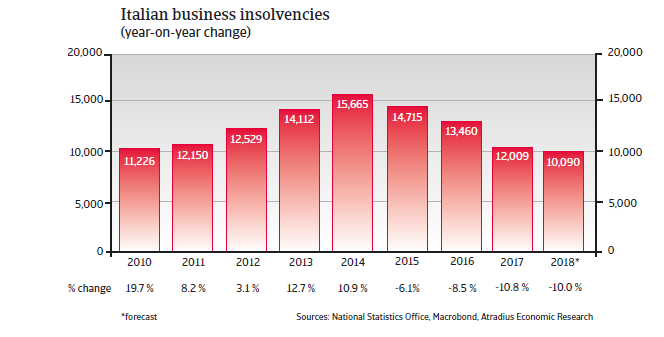 Since 2015 insolvencies have decreased and in 2018 a 10% decline is expected. However, the forecast number of about 10,000 cases is still much higher than that registered in 2008 (7,500 cases). 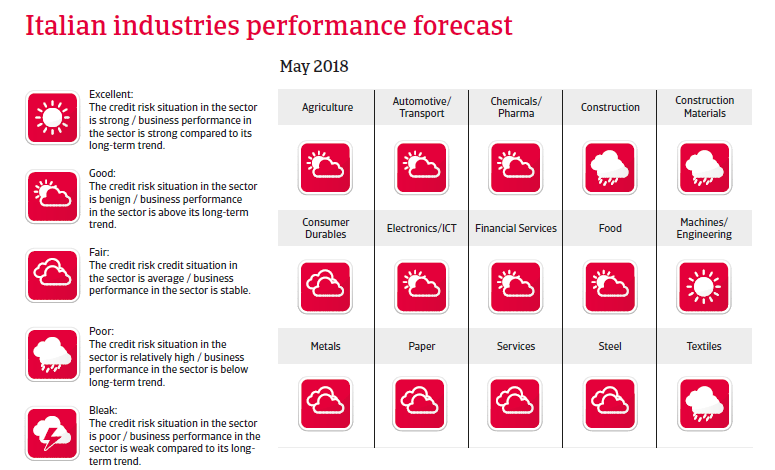 GDP growth has picked up in 2017, and is expected to continue in 2018. The rebound is broad-based, mainly driven by investments (mostly in machines and equipment) and export growth. Both business and consumer confidence have increased. However, major downside risks remain. Reform efforts (e.g. in the labour market) have, thus far, been insufficient to boost higher growth rates, and Italy´s competitiveness has not significantly improved compared to its EU peers. 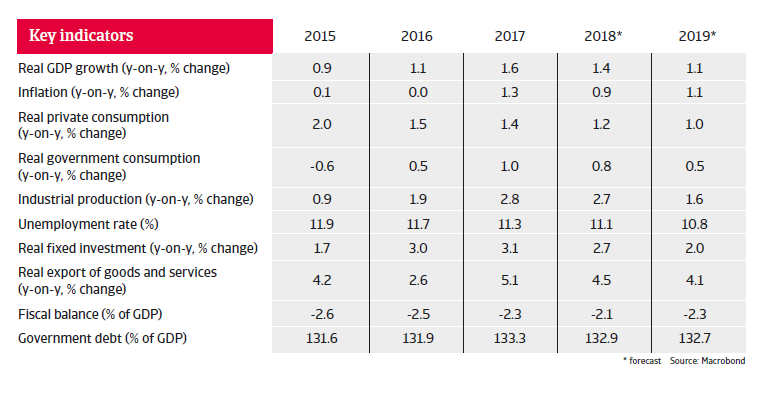 While the state of the Italian banking sector has improved in 2017 due to certain government actions (e.g. recapitalisation), many banks still suffer from non-performing loans, high operating costs and low profitability. Despite some efforts for fiscal consolidation, the government debt-to-GDP ratio remains high, at more than 130%. In order to decrease the debt ratio substantially, a nominal annual growth rate of 3% would be required. Fiscal policy remains vulnerable to interest rate increases. Political uncertainty remains a serious issue. In the March 2018 general elections populist and eurosceptic parties gained a major victory, and coalition talks are likely to become lengthy and cumbersome. The most likely outcome seems to be a hung parliament and even a snap election cannot be ruled out.